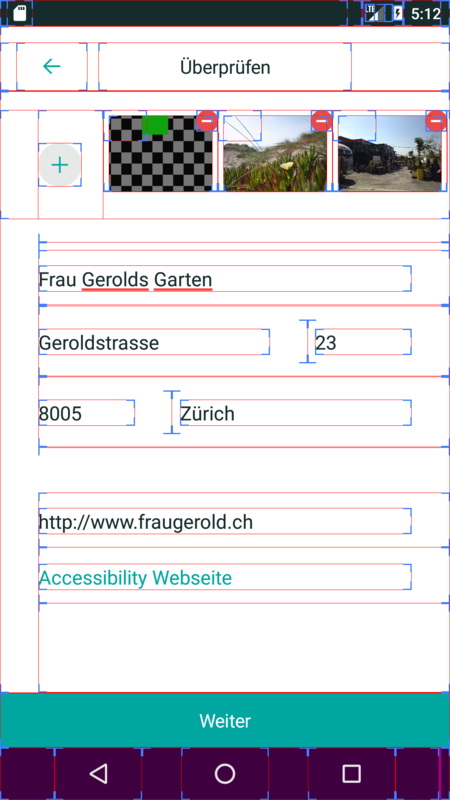 I have almost successfully created a Renderer in Android for a Horizontal ListView, because, as you know, is currently hacky with the built in ListView. I am looking for Help with Layout Rendering of the ViewCells. I would also be happy to share the CollectionViewRenderer on iOS using the GridCollectionView from iOS. The iOS Implementation works fine. While the views are mostly correctly displayed (defined in XAML), i have the issue that a GestureRecognizer on a CachedImage does not have the correct Touch Area. <forms2:CachedImage Margin="5, 5, 5, 0"
<BoxView Margin="5, 5, 5, 0"
Notice the small Rectangle to the Left Upper side of the Images, this is the only Area which triggers the TapGesture on the Image. Altough the Delete Button also has an Event attachted to it (via Caliburn Micro) It does not Work. Does anyone have any Idea why the Tap region is so small and why I am not able to click on the Image as well as the delete button? If anyone is interested in creating a OSS Repo with the HorizontalListView Renderers and distribute to NuGet, feel Free to Contact me for Code or Help. Found the Issue. In the ViewHolder for the Items I changed the way the sizes are calculated. The touch Area is now correct. That seems to have no effect. It's not recognized at all. My guess is that something with the rendering and layouting in the RecyclerViewHolder is not quite right. I am currently trying to figure this layouting process out by using https://github.com/twintechs/TwinTechsFormsLib . Maybe I get it working. @veryhumble Can you please share the collection view code and iOS renderer of collectionview.